If you have ever tried to make money online through affiliate marketing (and you most probably have otherwise you would not be here!! ), you will have most definitely come across JVZOO. In this review of JVZOO, you will find what JVZOO is, the features it offers and how it can help you as an affiliate marketer. Founded in 2011, JVZOO is an online platform where people can make money by selling their own digital products or selling other peoples products and earning a commission. For the past two years, it has been listed as one of the fastest growing companies in the Inc 5000 list. It is one of the top affiliate networks and sells products from a wide variety of niches. From my experience, the most popular niches are eCommerce, internet marketing and eCourses on how to make money online. The platform offers a lot of tools and services for both vendors and affiliates to help maximise their earning potential. It is a free to use platform, although there are fees for both vendors and affiliates when a sale is made. My review will be based solely on being an affiliate marketer and the quality of the products on the network. JVZOO has a lot going for it and it has grown exponentially over the past few years, however, it also has its problems like the quality of products on its marketplace which I will get to later on in this article. First I want to go over some of the features they provide for affiliate marketers. 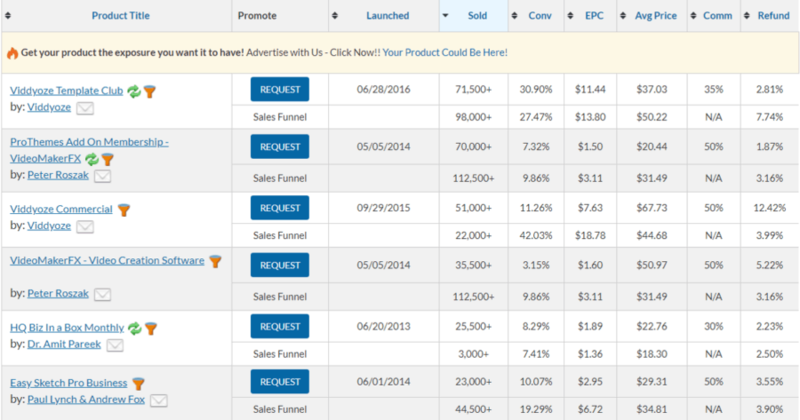 One affiliate link that tracks all the sales within a funnel. Affiliate campaign statistics including clicks, visitors, sales and conversions. Promote webinars with your own customised intro. 100% commissions on many front-end products. Now, I will be honest with you, I regularly visit the JVZOO marketplace and keep tabs on the best-selling products and I hardly ever see products in the self-improvement and health niche. Although I am seeing more products in the health and fitness niche but hardly any of them are top sellers. In fact, there is not a single product in the top 100 best selling products of all time on the JZOO network that is from the self-improvement or health and fitness niche. So, I really do not understand why they would put that claim on their website. In my opinion, the JVZOO marketplace is full of both good, bad and outright rubbish products. From my personal experience, software products are very popular on the network. However, even if a product does sell well, never equate with it being a good product. I have purchased a few products from the JVZOO network, some did what they were supposed, others came nowhere close and all of them had ridiculous claims on their sales page. All these products were best sellers and I was disappointed with many of them, although the products I was disappointed with were products I purchased when I first started affiliate marketing. Back then I never questioned the silly claims made on the sales pages and honestly thought making money online would be as simple as running a simple Amazon affiliate store!! The image below is from a sales page of a product I first purchased from the JVZOO network, trust me, you cannot make autopilot commissions just by creating simple affiliate stores!! However, I have learnt my lesson and now only purchase products after thoroughly investigating them. Look at their joint venture page, this is where they provide information about the product so that potential affiliates know what they are promoting. However, many serial product launchers have realised that many people read their JV page to find out more information about the product. So even the JV pages are kept intentionally vague (especially the ones that are selling a make money online course/training)and do not provide much information about the product. Most JV pages are now just full of hype and how much money affiliates can make. So, if the JV page is vague, which it usually is I wait at least a month and then read some real reviews, do not trust reviews written on the day the product is released. This is called launch jacking and I find it highly troublesome (more on launch jacking later). Sign up for a free JVZOO account and search for the product that interests you, analyse their sales stats and make sure the refund rate isn’t high. I usually only purchase products that have a refund rate of 5% or below, however, if the vendor of the product is someone I trust, then I am flexible with the refund rate, especially if it is a product that I really want. Sales stats are available for all free members of JVZOO. There are so many products that are launched every day on JVZOO and with a staff of 17, I don’t believe they have a proper quality control process in place to make sure products do what they claim on the sales page. This is the reason I believe why there are so many rubbish products in the marketplace and why launch jacking is so widely practised. Launch jackers are affiliates who get reviews access to products weeks in advance of their release so that they can write a glowing review and rank it on Google and YouTube. They usually entice people to buy from them by giving away huge bonus materials (most probably PLR products) and many do not provide an honest review of the product. Launch jacking is all about making as much money as possible during the initial launch period. It’s not a method I totally agree with, but it is effective when done properly and hence the reason you see so many positive reviews as soon as a product is launched. That is the reason I stated not to trust reviews of products that have just launched. Every day, JVZOO advertise a product of the day, you can see this on the top right-hand corner of their website. The JVZOO product of the day is usually one of the top three selling products and necessarily the top selling product. However, even the product of the day can be a dud, this is one of the reasons, if a product interests me, I wait until a month after it is launched to purchase it. Top sellers for the month. You can filter this list by either sales volume or total revenue. Like I stated earlier, just because a product is a top seller, does not mean that it is a good product. It just means that a vendor has a massive email list and lost of affiliates to promote for him/her. Can You Make Money With JVZOO? Well, it should be obvious by now, not only can you make money, but there are affiliates making six to seven figures annually with this network. However, making money with affiliate marketing is not as easy as some people make out. One of my first purchases from JVZOO was a product called Commission Machine by a well-known affiliate marketer by the name of Michael Cheney. Of course, back then, I was only too happy to depart with my money and become instantly rich, which of course never happened. The Commission Machine is just one of the many products on the JVZOO platform that make ridiculous claims about making money online. However, despite the many rubbish products in the JVZOO marketplace, there are good products that you can promote as an affiliate. I would stay clear of any products in the MMO like the Commission Machine niche as most of them are over-hyped and you can find better material for free. Just follow the method I laid out earlier and only choose products that have low refund rates and has been on the market at least a month. There is one thing you must be aware of, if you want to promote an offer from JVZOO, you will need to request permission from the vendor. From my experience, most vendors will grant your request if you let them know why and how you will promote the product. Of course, if you are new to affiliate marketing I highly advise you to learn how to build an affiliate marketing business before trying to blindly promote an affiliate offer. JVZOO have their own program called JVZOO academy that teaches people how to make money on the network both as an affiliate and as a vendor. It is a program that has been developed in partnership with Sam Bakker who is one of their top vendors and affiliates, it costs a one-time fee of $27 (but there is most probably some upsells) and the reviews have been mostly lukewarm, nothing groundbreaking and you can find better training with superior tools and services with Wealthy Affiliate. There are many alternatives to JVZOO, many of them have similar issues with regards to the quality of the product and services. Platforms like Clickbank, WarriorPlus and Warrior Forum all have the same problem, so I will not name them as good alternatives. Both AppSumo and Stacksocial are deal websites for digital products ( Stacksocial has deals for physical products as well). I purchased Serpstat from AppSumo for a lifetime deal at a ridiculously low price ( for anyone who may not be aware, but Serpstat is one of the best SEO tools on the market). They have real reviews from actual users and you can make an informed decision on whether or not the software actually does what it says. CodeCanyon sells a wide range of digital products, from Amazon affiliate themes like Rehub (endorsed by Amazon) to HD Stock video and images. They also sell WordPress plugins (a lot of JVZOO vendors sell WordPress plugins but do not actively maintain them), eCommerce software, Facebook apps and many other different types of digital products. So if you see a service or product that looks good on JVZOO but unsure of the vendor or if the product or service actually does what it says, check the above sites and see if you can find a similar product. You may find something better, with real reviews and better support. Like all business’s JVZOO has its fair share of criticism, the main one being that the marketplace is full of rubbish products. I will have to agree with that assessment, the company seems to have no quality control in place and just lets anything through. However, it isn’t just disgruntled customers saying this, I follow many of the top affiliates and vendors and some of them admit that the majority of products are rubbish. However, this is not just on JVZOO but also networks like Clickbank, Clicksure, Warrior Plus and of course the Warrior Forum. One other complaint I keep seeing is that many vendors just abandon their products and provide no support for existing customers. The main culprits are vendors who launch multiple products a year, sometimes vendors release different products that do the same thing. After a while, they completely abandon the product or do not keep it updated. Speaking strictly as a consumer and affiliate marketer, the JVZOO network has its fair share of good and bad products. There are many good products on this platform, the problem I have is that even good products have over-hyped sales pages. With every product, the message of the sales page is nearly always how much money you can make, there is nothing wrong with making lots of money, however, I find it highly unethical to make ridiculous claims that are never backed up by real proof. As for the bad products, the only thing you can learn from them is to study their sales page and see how they manage to sell such rubbish. If JVZOO had a more robust quality control process its marketplace would not be full of rubbish products that make exaggerated claims, the majority of complaints against JVZOO are because of low-quality products that do not live to the claims made by the sales page. I would advise against purchasing cheap make money online products there will be nothing in them that you would not find on YouTube, blogs and internet marketing forums. Those are the products that give the network a bad name, I understand why they let them through, it makes them a lot of money!! And unfortunately, that is what matters. I would also advise against purchasing products as soon as they are launched unless you trust the vendor. Overall, I believe JVZOO is a good network that has a lot of good products for both consumers and affiliate marketers, if they had a good quality control process in place, it would be a lot better. Have you purchased products from JVZOO? Do you promote any JVZOO products as an affiliate? Would love to hear your thoughts on this affiliate network. Want To Start An Affiliate Business? Try My No.1 Recommendation. Very detailed review and my first exposure to JVZOO, your comments come across as being genuine, they are well balanced between likes and dislikes or concerns. My initial response to this company is to stay away and not have anything to do with them, basically due to the false claims and the get rich quick ploys. Integrity is very important and you do not want any outside influence to tarnish a reputation, especially one online where no one knows who you are! Just the same, it is nice to see someone look at both sides of something and give an impartial opinion on the subject. JVZOO are a good company, if they could just reduce the amount of misleading products that are on their marketplace, it would be better for both the company and consumers. Thanks for the jvzoo review. Everytime I read a review of another website promising to make me rich I am happy to know not to use them. A lot of dangerous businesses out there just wanting your money. Sounds like for the most part jvzoo is like that. I will stick with Wealthly Affiliate thank you. WA is the place to be to learn the ropes of affiliate marketing without any shortcuts promised to success. Thanks for your comment, while JVZOO does have its fair share of really bad products, it does have very good ones as well. My advise would be to thoroughly research any product you purchase from the network and be wary of products that purport to teach you how to make money online, those are the ones I would steer clear of. Thank you for this indepth look at JVZoo. I have a website that is in the MMO niche but I don’t really promote a lot of products there simply because I have found that the majority of MMO products are simply terrible. I have also learned – I am not impressed when I see terms like “earn on autopilot” and “secret method”. I had a look at JVZoo a while back and I saw way too many products with dodgy sales pages and the truth is that I couldn’t be bothered wading through all of that trying to find something to promote. The way that I personally do affiliate marketing for MMO is that I promote products that I personally use and trust. Yes the products are few and sales are more slow than if I had to make outrageous claims but I can sleep at night knowing that I am being ethical. I am sure I could make a lot more money jumping on the BS wagon. Yes I agree that there are some good products at JVZoo but I don’t enjoy sifting through all the bad ones to find something worth promoting. I do sometimes wonder how people keep a clear conscious when they promote all these products, especially those in the MMO niche that never live up to the sales page hype. Also promoting multiple products in this niche wil never help your audience, they will jump from one shiny object to the next. Hi and thanks for your thoughts on JVZoo. When I got started in affiliate marketing I kept hearing about JVZoo and how easy it is to make money with JVZoo. So naturally I set up an account to find out more. I didn’t very far and logged out with the view to come back and give it a thorough look. Then I started getting bombarded with emails about products to promote that sounded like junk products. So I started to research it and found exactly what you’ve said – whilst there are some good products, there are some very poor products also. The quality control isn’t good at all. I’ve since had a good look around JVZoo and have to say I’m pretty unimpressed with many of the products, and their absolutely ridiculous claims. I’m yet to buy a product from JVZoo, and I definitely have not promoted one as affiliate. Thanks for your comment, yes I forgot about the emails, you will get sent emails multiple times a day, it does get very annoying. Especially when you find out the product densest do what it is supposed to. I’ve been using Clickbank over the last couple of months as an avenue to monetise my relatively new blog – I’ve never even heard of JVZOO before! I’m not exactly what you’d call an experienced affiliate marketer, and my site is new – would they consider taking me on, or do they have strict entry requirements that everyone has to reach? Thanks for your comment, you can become a free member of JVZOO, however, to promote any product that you may like, you will have to get approval from the vendor. That is one of the differences between JVZOO and Clickbank. Thanks for the review, it looks like a decent platform, if you manage to stay away from products that teach you how to make money online. I have never purchased anything from this network but if I ever do, after reading your review, I will be very careful and do my research if a product interests me. Thanks a lot for the detailed review on Jvzoo and very helpful. I am full-time blogger and I have purchased few products which claimed that they will help me make money online but as you said your experience its the same for me, the sales pages are of too much hype and the product under delivers. I am not saying all the products are like this but most of the products are just a basic information which we can find it on Youtube and Google. Apart there are genuine products as well. To share my personal experience with Jvzoo I find it hard to use it and for me its not user friendly often I am confused. Muncheye section is the one I like and very helpful to know about new product launches. Thanks again for the comprehensive review. Thanks for your comment and totally agree with you, I also regularly visit muncheye to see if there any products that may be useful to me. Its a good site to find out about products and what they do before they are released. Great review! JVzoo is certainly a very interesting network. Personally i have always been very skeptical about using it because of the lack of quality control (like you said). From other reviews i have read JVzoo is even worst than ClickBank. There are so many low-quality products that makes it difficult to find good quality products. After all, your reputation as an affiliate marketer is everything. Promoting a rubbish product will cost you a lot more than any make commissions you might earn. But after reading your review i think i should take a closer look. Thanks for your comment, yes you are right, if you start promoting all sorts of rubbish products just for a commission, it will be bad for your reputation in the long run. Always do your due diligence before purchasing products from any affiliate networks. Thank you for sharing your review about JVZOO. I have gone to this website in 2 last months when i was looking for a website which will help me to make money online but as you told us it seems too vague and a newbie on internet marketing can’t get anything . I am not sure if you have met many websites as i, but many are scam. I am happy that i will not try JVZOO because it seems to be not organised . Thanks for that review on JVZOO. I had not come across them before, but after reading your review I think it is something to steer clear of. Anyone that claims you can make money on line on Autopilot is misleading people, it is simply not that easy. Making ridiculous claims of newbies making a couple of thousand dollars a day is a red flag in my book. It all sounds too hard having to sort through all the inferior products to find a good one. Thanks for making such a fair and impartial review of JVZOO. Another one to avoid. Thanks for stopping by and commenting, I think you may have misunderstood my article, I do think JVZOO is a good network but I advise people to steer clear of products in the MMO niche unless they know the vendor and trust them. JVZOO does have very good products in other areas of internet marketing, especially in the video software niche. Don’t avoid it, research products that look good and then purchase if you think it may help you in your business. I bought a Pinterest training course and a plr product which are very helpful to me . After buying those products I started seeing influx of products in my email daily which raised my curiosity ,all claiming to make easy money for you . Ridiculous claims,that raised my eyebrows. Your blogs have said it all,jvzoo is a market place one need to trade with caution .